The Italians serve risotto as a starter, in smaller portions, which I think is a better way of appreciating it than when you get a big main course plateful. This recipe serves five, as usual here on the blog! For a light lunch, serve with a crisp salad and some sliced Speck or Parma ham. For the wine, I used a lovely Sancerre with hint of citrus and a crisp finish which made the dish taste quite lovely and lemony- like an italian lemon grove! You need a zesty and quite acidic white for this. Prepare the squash flesh by peeling and dicing it with your sharpest knife. Season the butternut with salt and pepper and rub some oil into the cubes. Put in a roasting oven for 15 min, checking and shaking regularly. Take out when the flesh is tender et slightly charred on the sides. Chop the herbs and shallots finely and fry them in a thick bottomed pan: I used a wide cast iron one that I’ve owned for the whole of my Londoner’s life. Add the rice to the pan with the fried shallots. Add the stock and wine bit by bit while turning: let it bubble on low heat. When all of the wine and stock has be absorbed, the rice should still be slightly ‘al dente’ under the tooth. Better to leave it too soupy than to dry it out! Check the seasoning and add some- or not. I added a good scraping of butter but you don’t have too if it is moist enough. At the last minute, chuck the cooked flesh and the goat cheese into it. Just before serving, pour into a warm gratin dish, with a sprinkling of olive oil, some cracked pepper and a generous amount of grated cheese such as cheddar and put back a few minutes under the grill until it turns a nice golden colour, 3 to 4 min at the most. Once you’ve got the hang of it, risotto is actually a fool-proof dish and a great fall back recipe for when the cupboard is bare. The key is to cook it long enough and not to let it dry out. 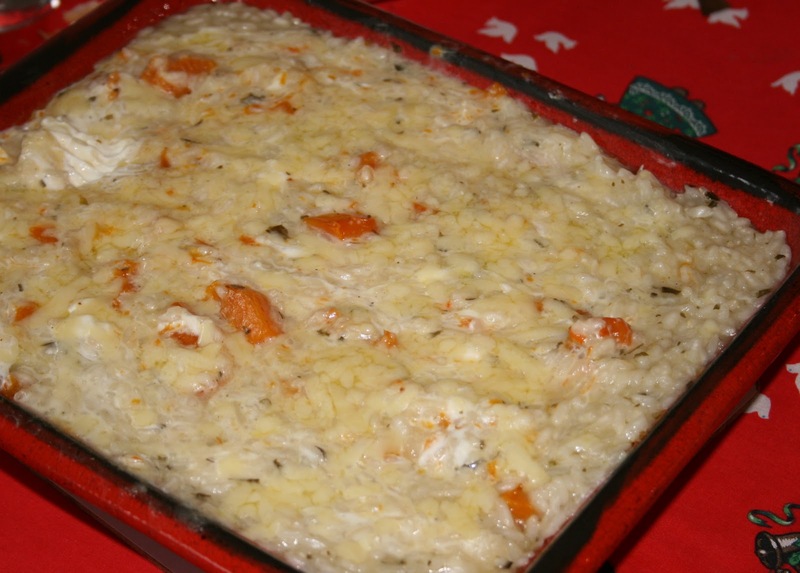 This entry was posted in family favourite and tagged cheese, pumpkin, risotto. Bookmark the permalink.